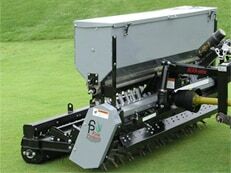 Turf Maintenance offers over-seeding for your golf greens, tee boxes, golf fairways, and roughs. With specialized equipment we can over-seed into fine turf areas with minimal impact or seed and aerate in the same pass to achieve excellent results. Save time and money in your golf course maintenance! Fill out our Free Estimate form to get started. For More Information Call Us at 507-452-6312.